Unless your recording room is acoustically treated, you probably capture “room sound” in your recordings. This isn’t necessarily bad: Some rooms have a great ambience which adds natural depth to a mix. But the room sound in smaller spaces, like most bedroom and basement project studios, usually hurts rather helps a track. Ethan Winer outlines the main issues – comb filtering and room modes – in his article on recording spaces. Vocals tend to need compression, which raises the noise floor of a track and makes the room sound more obvious. The best vocal microphones have omni and cardioid polar patterns, so they inherently capture more ambience. Many singers like to stand a few feet from the microphone, allowing more of the room sound to leak through. Douglas realized that for a microphone to sound good and tight you didn’t need to be inside a sound box – the microphone did. So, he built a simple 16” by 16” four-sided box out of foam core, lined it with acoustic foam (usually sold in 16 x 16 inch tiles), stuck his microphone inside, and recorded with it. Dubbed the VO Box, the results were stellar even in a “bad” room. While the project as described is easy to build, you could probably simplify it even further by using a plain old cardboard box and rockwool or stiff fiber insulation. What a great idea… I’ll be trying this out later! i made one the other day with an old box, some wood for support, and some old carpet. 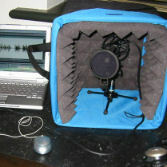 it really helps to make the vocal sound very dry since i have sub par acoustics in my “studio”. this article was great and inspired me. Great idea!! I’m gonna go make one. hey man, does this work great with a headphone mic? I’m under a serious budget and I can’t spend much on a mic till I’m 17. Yeah this is a problem I’ve been having on my recordings. Check out my songs and let me know what you think of the vocal sounds. I use reverb obviously but I think a trained ear could probably hear the natural room as well. But I like this idea very much. nice idea, I should try this. Isn’t this EXACTLY Harlan Hogan’s Portabooth? He’s been making these since 2007, I believe.